Before I begin, just to set the tone for this blog and the location we stayed in, let me tell you this… The first thing we saw upon entering the hotel and getting into the check-in line was a man checking in at the reception desk, with no top on. I think from then on we knew this would be an amusing night. 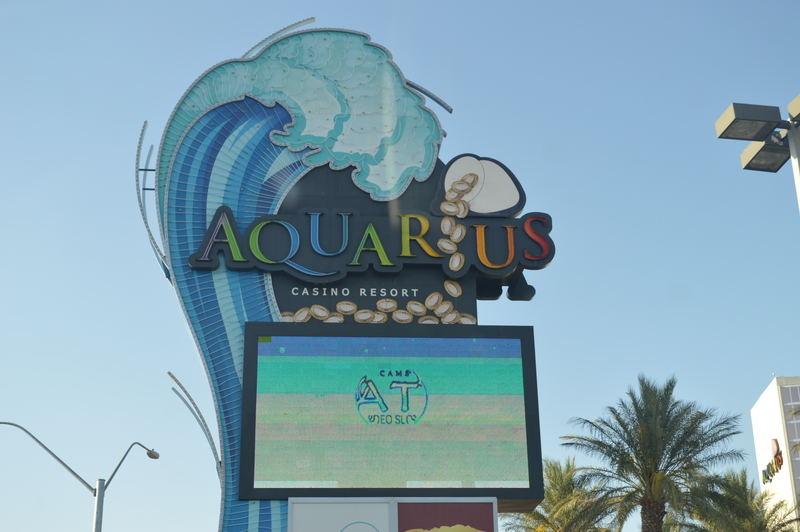 While that might have been our introduction, that is definitely not to say that Laughlin wasn’t a great place, because we were pleasantly surprised by how good the Aquarius Casino and Resort turned out to be. This city, which is essentially a mini Vegas, really exceeded our expectations. 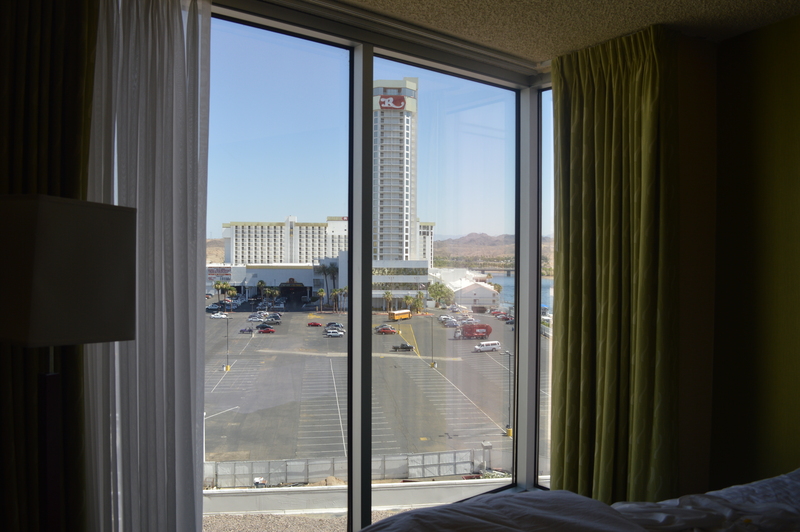 We secured our room for a tidy 35 dollars and it had immediate views of the Colorado River and mountains behind – not too shabby. 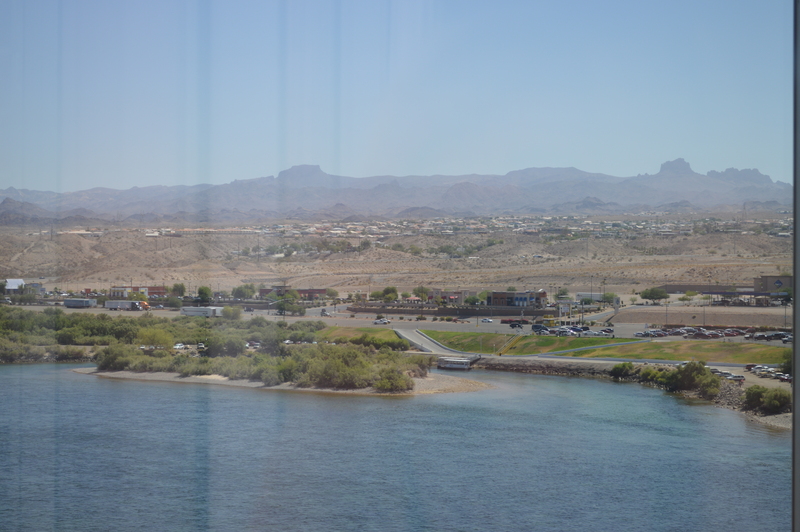 And even better, we managed to tick two states off our travel list while we were staying here as Bullhead City, Arizona was just on the other side of the river. We all love a good casino and this one had me reminiscing about that Friends episode where Phoebe battles with an old woman on the slot machines. I’ve never seen so many old people, walking around with their zimmers, looking to make a quick buck on the slots. It was almost comical and the massive casino that the hotel boasted was just full of those types. But then who am I to talk, as later on we got sucked into dropping 80 dollars on a slot machine called Bamboo Panda. What can I say, the bright lights and loud noises just took over any rational thought I had. Suffice to say it’s a good job we only spent one night there! 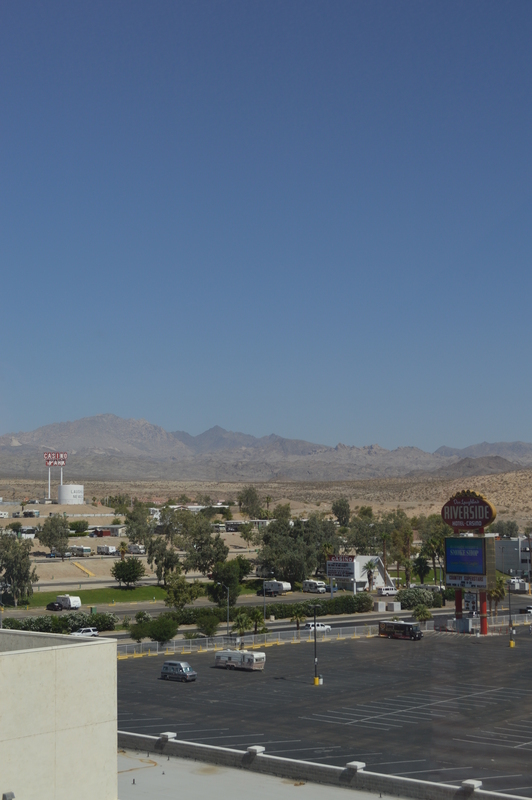 The only negative I have of Laughlin was the stray cat situation. Yep, I know what you’re thinking, she went for a night of casino fun and now she’s going to harp on about the mad cat epidemic. But seriously, there was an abundance of stray cats and kittens by the waterfront and it was heartbreaking to see. What was more heartbreaking was the signs which stated you must abide by the law and not feed any of them. I’m sure you could sort something out there Laughlin… ever heard of an animal rescue centre? Despite this, it was a good stopping point on our trip and a great alternative if you don’t have the money to splash in Vegas! Start from the beginning of our American travels and read part one here.